Initially I saw this game and thought, “That’s nice, but it’s mostly good for story-telling and vocabulary building.” Both skills are useful, but they don’t really make the cut for this particular blog series. And then I dove deeper. And then I fell head over heels for this brain-building, fun-for-kids, can’t-get-enough-of-it game! Well, technically it’s not even a true game. More on the game aspect in a minute. Oh, so many things to love about these fun little story cubes! 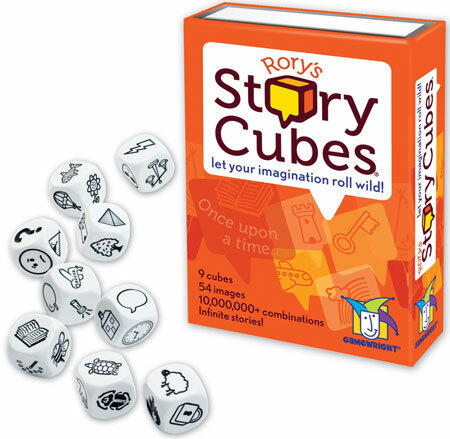 Rory’s Story Cubes consist of 9 dice-like cubes. Each cube contains a different image. Since no two images are alike, you have 54 of them to play with. Also included: ideas for how you and your family or friends can build stories with the cubes. That’s fun by itself, without being competitive, but that’s not why I love them so much. I could be here for days telling you all the things I love about these cubes (as I’ve done with other games in the rest of the series). Instead I’m going to share just a few of the countless ways that you can use these cubes to help expand your child’s ability to learn. Whether specialists use these as therapeutic intervention tools, or parents just want to help improve cognitive connections in a laid-back, stress-free sort of way, these adorable little dice have countless applications. Working memory allows us to remember information long enough to do something with it. For example, we need working memory in order to complete math equations in our minds. What is 12 + 17? We must remember 12, and 17, and then somehow add them together without using a pencil, and without forgetting what the original numbers were. That’s working memory in action. For simplicity, let’s call this alternative story cube activity Lose a Cube, Find a Cube. Your child randomly chooses 1 image from the 9 cubes (or you choose for her). She takes a mental photo of it, then puts the cube back into the mix, and rolls them all. Did her image appear face up on any of the cubes? Can she remember her image long enough to sort through all of that visual stimuli? If she can’t find her cube, she rolls again until she finds it. If one image is way too easy to remember, next time try two images at a time. She keeps rolling until she finds both. Phew! That’s tricky! Use the same activity above, only this time, instead of showing him an image, describe to your child, in detail, what the image looks like. There’s a catch. If you choose an image of a lightening bolt, don’t tell him that it’s a lightening bolt. Tell him that it has jagged lines and a pointy tip and you might see one of these in a storm. A little critical thinking may be required in order to figure out what you’re talking about. Your child listens to your description, then describes the image back to you. (You always want to check for understanding.) He then rolls all 9 cubes. Can he find the image you described? If not, he rolls until he does. Too easy? Try two image descriptions! Then three! This requires a tremendous amount of concentration. It also requires the ability to visualize what you describe. That brings me to my next learning skill-building activity. For kids who aspire to become strong, confident learners, visualization skills are imperative. As long as your child’s visual memory is strong, she’s ready for advanced visualization strategies. Let’s take advantage of these simple images. Roll 3 cubes to start. Any cubes will do. Choosing one of the 3 images that roll face up, your child creates an image in her mind that begins a sentence you will create together. Ask her to say the first phrase of the sentence. Then ask for ALL of the details, color, size, shape, perspective. Repeat the phrase back to her (to now check for YOUR understanding). Now it’s your turn. Choose a second cube. Say your child’s phrase, then add to it. Describe all of the detail you can. Can your child repeat her phrase and yours? Finally, your child gets to finish the sentence with the last cube. Keep drawing out the details. Challenge each other to recite the sentence word for word. You can even write it down when you’re done, and create a collection of sentences. If 3 cubes was easy, move up to 4 next time. Or, if a 3 cube sentence is too easy, try creating a complete sentence for each cube. You will each memorize a 3 sentence story. Can you remember it all word for word? You’re really exercising those visualization muscles! Oh, and you may have guessed, this visualization strategy involves listening skills, auditory memory, visual memory and attention as well. And that’s in addition to the creative story-telling and vocabulary-building. Win upon win upon win! 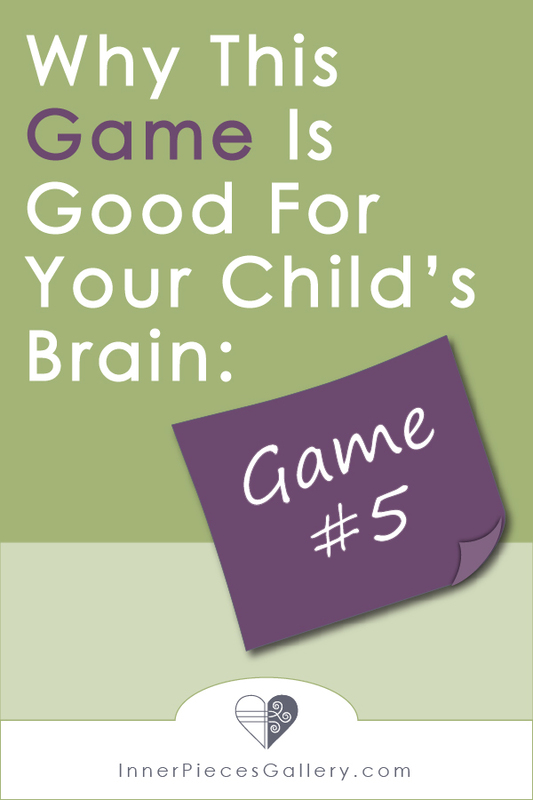 Or, learn even more fun ways you can help your child build learning power.